On every fight card there is a bout planned that flies under the radar, but screams “watch me!” at the same time. As UFC Fight Night 81 approaches, it is clear that the main event draws in all of the attention, but there is a fight located further down the card that could easily steal away “Fight of the Night” honors. The bout between Paul Felder and Daron Cruickshank has the potential to be one of the best fights from not only the night, but from the entire first month of 2016. Felder and Cruickshank are two fighters that are in similar situations heading into this fight. 2015 didn’t end well for either fighter, as they both closed the year out with two straight losses. Cruickshank suffered when his weakness in grappling was exposed by James Krause and Beneil Dariush. Both men were able to negate his high level striking and submit him with relative ease. 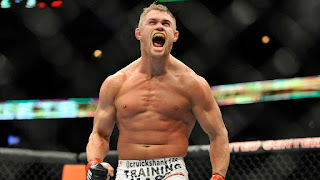 Before that, the UFC used Cruickshank in bouts against other high level strikers with the hopes that they would put on a show on the feet. Unfortunately, that strategy didn’t work out for “The Detroit Superstar,” as he has gone 6-5 in his UFC run, with one No Contest. Felder, on the other hand, may be riding his own two-fight losing streak, but he’s in a position where he remains in the “good graces” of the UFC. His last two fights against Ross Pearson and Edson Barboza were both very violent and exciting. Even though Felder came out on the wrong side of both decisions, he isn’t too far outside of the Top 15 in the lightweight division. One or two more wins and he’s immediately pushing towards important fights for the rest of the year. Style-wise, it will be interesting to see where this fight occurs. Felder proved in his previous bouts that he can hang with some of the most effective strikers in the sport. Both Barboza and Pearson used their Muay Thai and traditional boxing skills effectively throughout their fights, but Felder answered back at every moment. Cruickshank’s striking is his calling card, and he will certainly be inclined to work that game in this bout. However, viewers shouldn’t be surprised if Felder takes the fight to the ground in hopes of securing a victory by exploiting Cruickshank’s main weakness. While he doesn’t have any submission victories to his credit, he does work with a team in Renzo Gracie Philly that is well-versed in the area. Still, a standup battle should be the expectation heading into this fight. Both fighters should be extremely aggressive, as they are both in precarious positions when it comes to keeping their spots on the UFC roster. The organization has begun to cut fighters and replace them with new prospects, so any additional losses could result in pink slips for these men. Whatever the outcome, Paul Felder vs. Daron Cruickshank is the fight to watch at UFC Fight Night 81. As the old adage of “styles making fights” goes, this is the exact type of matchup that brings together two high-level strikers in an affair that leaves the viewers wanting more. 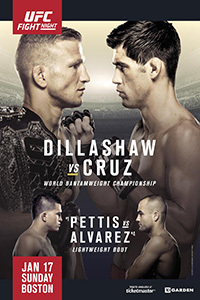 UFC Fight Night 81: Dillashaw vs. Cruz takes place on January 17, 2015 at TD Garden in Boston, Massachusetts. Click the stars to rate how good you think UFC Fight Night 81 will be.